Joining the lineage of other prolific Long Island hip hop pioneers such as Rakim, EPMD, De La Soul and Public Enemy. Lyricists I.N.F. and Aspect are collectively known as The Day Laborers. A duo who have spent years building a buzz the old fashioned way. Defining themselves on stage performing at venues all over New York City. Most notably a series of highly successful shows at the lengendary CBGB's at a time when the venue had not opened it's doors to hip hop for years until The Day Laborers arrived on the scene. Following momentum from those shows they released The Red Sky EP, then entered the studio intent on crafting an album that encompasses the best of what underground boom bap and raw rap has to offer with a refreshing style accessible to mainstream appeal. Their agile flow displays a smooth delivery interweaving intricate and articulate rhyme schemes about introspective topics that all hard working common people can relate to. Whether you're a blue collar worker or put on a suit and tie this music is for you, the youth culture and young adults coming of age. These musicians profess "we've taken everything that was classic to us and updated that sound into songs that currently sound relevant but can still be considered just as relevant years from now. 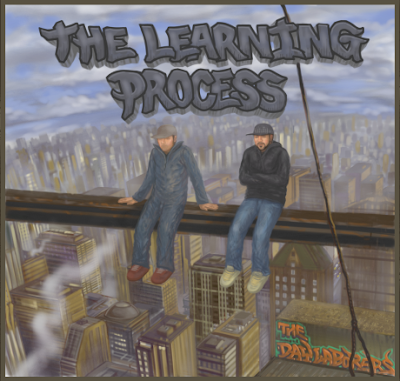 With the release of their debut album, The Learning Process, The Day Laborers are set to make their mark with music in a major way.